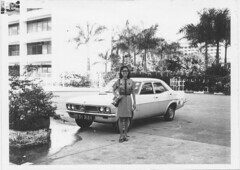 I was born in the fifties and stayed at Old Kallang Airport Road. In those days all rental flats was under the SIT program and we were staying at block 25 in Jalan Tiga. 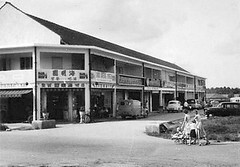 During the early sixties, my parents had a stall in Genting Lane at MacPherson called Teck Hock Pte Ltd. In those days, it was known as Teck Hock Kopi Long. It was a big factory where all the coffee beans were unloaded and stored in a big warehouse. Some of the beans were sold locally but the majority were exported to the neighboring countries. I used to accompany my mother to the market to place orders for cakes such as the nine layers Kueh, Han Chien Pien, You Char Kueh etc. In those days, we paid 10 cents for three pieces and sold it for 5 cents per piece and made a profit of 5 cents for every 3 pieces sold in the “Kopi Long”. I also patronised the cheap open air cinema called Peking Theatre located opposite the present MacPherson market. To watch a movie, we only paid 5 cents but you have to endure the mosquitoes and there were no refunds if the show was cancelled due to heavy rain or power failure. Adjacent to it, there is an open field where circus shows like “Tai Tien Kiew” and “Great Circus Of India” were held. 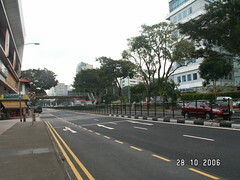 The stretch of MacPherson Road I am talking about as it is today. I often walked from my home to Geylang Lorong 21 and took the Tay Koh Yat (blue) bus. The terminal was located opposite the Geyland Post Office. We used to pass by a Chinese temple before the post office and had free Chinese tea there. There was also a “Sinalco” drinks factory until it was demolished in the early seventies. I do hope to walk down this memory lane once again and re-collect all the things that I had done during my younger days; such as catching spiders, scooping longkang fishes, running bare-footed selling “Ma Piew Poh” and chasing after kites. We only pass through this earthly life once; so be contented in what ever situation you are in. The Apostle Paul wrote in the New Testament: “Godliness with contentment is much gain”. I was looking through my sister’s old photos when I came across this one of her and her students at Mattar East Primary School. My sister, Pat joined the teaching profession after she completed her Senior Cambridge (equivalent to our ‘O’ levels) exams and continued for more than 30 years until her retirement recently. Mattar East was her first assignment after completing her stint at the Teachers Training College in Paterson Road. This photo was probably taken around 1970 or 71. You will notice that the picture is still very clear and you can easily make out the faces of the kids. What was even more interesting was the list of names written in pencil at the back of the photo. PS: The first name is Woo Mei Lai. You can click on the photos for a better view. If you happen to know any of these kids – they must be in their forties by now – please ask them to come here and say good morning to yesterday; as well as to their teacher Miss Lam (now Mrs Pat Liew). As this school was just around the corner from my workplace, I decided to pay a visit to see what it is like now. 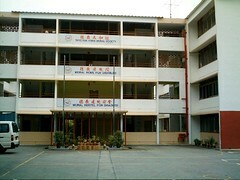 Like my primary school, it has also become a school for handicapped children. The caretaker informed us that its neighbour, the Mattar West Secondary School has been demolished recently. Here’s another photo of my sister next to our family car. Who can tell me the make/model of this (other) beauty? 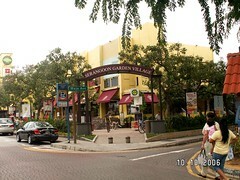 Do you know what is the name of Serangoon Gardens in Hokkien? Older Singaporeans will know that it’s Ang Sar Lee which means Red Roofs. In the 1950’s and 60’s, this estate was mostly populated by British military forces’ families. As such most of the streets here have British names like Farleigh, Kensington, Chartwell and Cardiff. In those days, many of the houses had red-colour tiled roofs, and hence the name Ang Sar Lee. 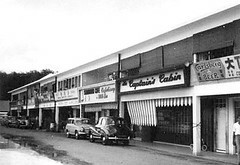 Thanks to Johnny Ho who contributed these two 1960’s photos of shops in Serangoon Garden to Memories of Singapore and used with permission here. Can anyone identify the streets depicted here? 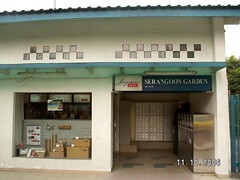 By the way, when I checked the street directory, the name is officially Serangoon Garden (singular), but I am pretty sure, it used to be Serangoon Gardens (plural). I wonder if anyone is able to throw some light on this mystery. Anyway, I will simply refer to it as SG.Our family’s acquaintance with SG was mainly in the 1960’s after the new road, Lorong Chuan was built, joining it to Braddell Road, and passing by Our Kampong at Lorong Kinchir. This must be around 1961 or 62. We usually cycled the 2 to 3 km and occasionally I liked to take the short cut via Cardiff Grove and Chartwell Drive, instead of the main roads Lorong Chuan and Serangoon Garden Way. I remember seeing a beautiful church but cannot recall the name. My eldest brother Chun Chew suggested that we make a visit to SG and take some photos of the familiar landmarks before they suffer the same fate as many other famous landmarks in Singapore, and of course to blog about it. And so last week, we took another trip down memory lane. My sister Pat, joined us. She was eager to revisit the famous Chomp Chomp food centre. After driving around a bit, we made our first stop at the former Paramount theatre along Maju Avenue. This place held many happy memories for us. We watched many movies here. Let’s see if I can recollect some of them. Besides the Hercules series which I mentioned earlier, there were cowboy Westerns, Japanese Samurai movies (the name Shintaro sound familiar to you) and of course the Shaw Brothers kung fu movies directed by Chang Chieh and featuring stars like One-Arm Swordsman, Wang Yu, Lo Lieh, Yue Hua and Chen Hung Lieh. One particular title I recall is the very funny It’s A Mad Mad Mad Mad World. Like many of the old cinema halls in Singapore, Paramount Theatre has been converted into a shopping centre. We frequented this row of shops facing Paramount Theatre. We often stringed our badminton rackets at a shop called George .. something. I remember buying or renting the very popular Beano and Dandy comics at a corner Indian stall at Farleigh Avenue. This is a shot of the SG Circus viewed from SG Market entrance. We had our lunch at the newly renovated market and food centre before making our way back to Maju Avenue where I had parked my car. Along the way, we stopped by the Post Office and the famous Chomp Chomp Hawker Centre, which didn't look like it was in operation - most of the stalls were closed. I remember they used to have an excellent popiah stall here. 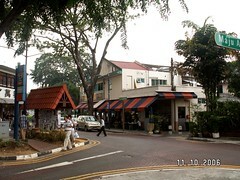 This is the original SG Post Office directly across the road from the market. Wonder how long before they tear it down. Regrettably, my photos did not turn out well. The haze and overcast sky to be blamed of course. Which gives us a convenient excuse to visit again, maybe when my brother returns from Australia. On the way back, we detoured to our see what was left of our kampong at Lorong Chuan. Share that with you next time. 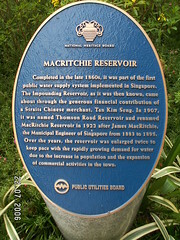 I was indeed glad to read the announcement in the papers last week that the National Parks Board plans to upgrade the MacRitchie Reservoir next year. Apparently there has not been any major upgrading for 40 years. As such, the landscape has not changed much from what I could remember of the place from the sixties. In my secondary school days, our school used to hold our annual cross country races there. The jogging track has largely remained unchanged except that they have put in more gravel and so it is less muddy and slippery on rainy days. I remember many of us slipped and fell when we came to the steep slopes and got ourselves covered with mud. The muddiest section was the stretch leading up to Lornie Road next to the golf course. The mud also had a distinct pungent odour. Every time, I smell something like it, my mind goes back to those school days. I also remember our cross country champion by the name of Mirza Namazie. He was a state runner and none of the boys could even get near to him at the finishing line. When I was working at Philips Factory in Lorong One Toa Payoh in the late 70's and early 80's, my colleagues and I used to go jogging at MacRitchie every Wednesday after work. After the run, we would adjourn to a nearby hawker centre for dinner. Needless to say, we more than made up for the lost calories. Our favourite eating place was the Whitley Road hawker centre located under the Thomson Road-Pan Island Expressway flyover. The other favourite was the food stalls at the Lake View Estate which was demolished a couple of years ago. 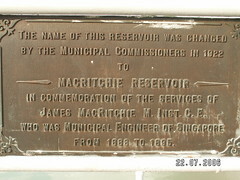 For the past one year, I have been going to MacRitchie Reservoir quite regularly. Ever since my son’s kayaking training was shifted there from Kallang River last year, I have been going there about twice a week to do my brisk walking exercise and fetch him home in the evenings. Lately, my old friend and fellow office tenant, Chuck has also joined me. The biggest drawback with the MacRitchie Reservoir is the traffic system. If you drive, it is very difficult to leave MacRitchie by its sole exit during the evening peak hour. The constant stream of vehicles speeding down Lornie Road towards the Thomson Road Flyover makes each attempt to leave an exercise in faith. On days when there are big events like cross country races, the problem becomes even worse. There was one occasion when a school bus broke down on the steep slope just before the exit causing everyone to turn around and leave by the entrance near the Thomson-Lornie Road junction. I remember a time when the traffic in the area was much lighter and the environment much more peaceful. 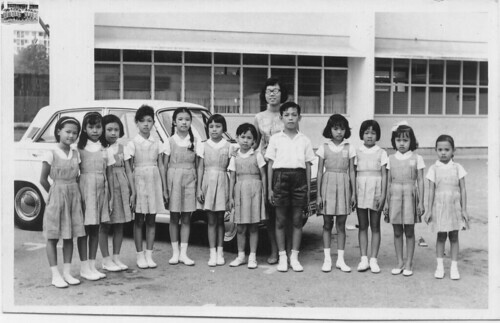 This was in the early sixties when I was studying in the nearby Braddell Rise School. 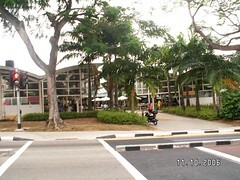 In front of our school, where Braddell Road met Thomson Road there used to be a circle. There were some beautiful red seal palms planted in the circle. Of course there was no viaduct linking Upper Thomson Road to Lornie Road in those days. 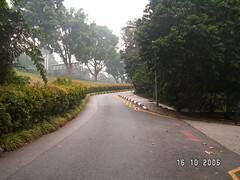 The stretch of Lornie Road between Thomson Road and Caldecott Hill was narrow and winding with plenty of vegetation on both sides. It was at this spot that I caught one of my biggest spiders. Catching spiders was one of our favourite pastimes those days. The portion of old Lornie Road where I caught my spider is still there but no longer in use. In primary school, our teachers occasionally brought us for ‘excursions’. I mentioned one such excursion to the Botanical Gardens in a previous post. Today, I want to share with you a very interesting story related to another excursion to the nearby MacRitchie Reservoir. I was probably in Primary 2 or 3 at that time. 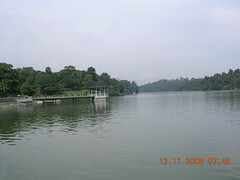 I remember lining up in twos and crossing the road to MacRitchie Reservoir where the entrance was. As we passed the car park, I notice a familiar Hillman. It was the same one that my parents hired to fetch us to school. In Hokkien we call it ‘pa-ong chia’. 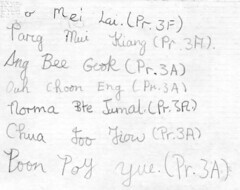 At that time, I was too young to take public transport on my own; and so my parents engaged one of the villagers by the name of Mr Ang (but we know him by his nickname Ang Niao Che, or ‘Red Mouse’ in Hokkien) to fetch my brother and I and some other BRS students to school. Our driver was quite a cheeky young man. Every morning he drove us from our kampong at Lorong Kinchir towards Braddell Road along a dirt track which later became Lorong Chuan. 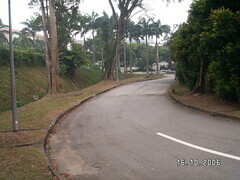 As we approached Braddell Road, we often saw a pretty lass drawing water from the well on the right side of the road (where the CTE would be now), and our driver liked to tease her. So that morning, as we passed the Hillman, I saw a couple smooching inside. Can you guess who they were? It was our driver and that pretty lass by the well. Apparently, the Red Mouse had progressed from teasing to kissing. Anyway, the story had a happy ending. Not long after, our Mr Ang married the girl in the Hillman and presumably, they produced lots of little red mice and lived happily ever after. 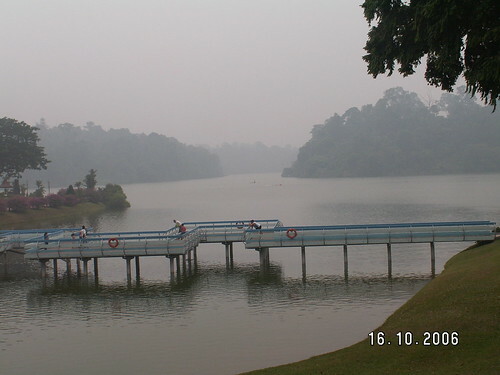 This photo of a very hazy MacRitchie Reservoir was taken this afternoon when the PSI or Pollutants Standards Index was an unhealthy 130. In the 70’s, a very popular rock group by the name of Deep Purple had a big hit titled Smoke On The Water. Thanks to our Indonesian neighbours, we have our own Haze On The Water. The other day, I went to buy some popiah and noticed that the hawker used an interesting gadget to slice his hard boilded egg. He put the egg into a plastic clampshell -like mould and closed it over the egg. The top half of the mould has sharp 'knives' which cut the egg into several slices in one swift motion. I wonder if hawkers nowadays all used this 'modern' method. In the old days, the hawkers usually used a thin thread to slice the egg. He ties one end of the thread to something firm. The other end of the string is pulled taut with one hand and then used it to slice into the egg which is held in the other hand. Thanks to Umami for permssion to use this photo of mee siam with hard boiled egg. Once a month, I follow some Christian friends to visit the old folks at the Lentor Residence. Recently I discovered that one of the residents knew my father. 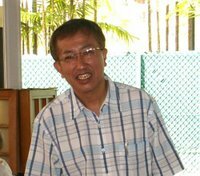 Like my dad, Mr Tan Pan Beng was a member of the Serangoon Garden Citizens’ Consultative Committee for a number of years. Initially, I was a bit suspicious of this 80-year old’s ability to remember things from such a long time ago. But when he was able to describe our kampong, as well as tell me the name of the other village representative from Lorong Kinchir, a certain Mr Low Thiam Aik, I was convinced, and of course thoroughly amazed. In fact he could even recall one occasion when he visited our kampong to mediate in a dispute between us and our tenant, a certain Mr Tan Kuan. And so, I asked him to tell me a bit of his life to share with you on this blog. 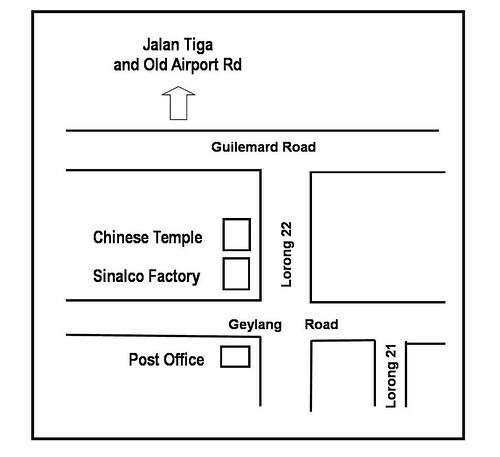 Mr Tan Pan Beng was born in 1927 in a small Malayan town known as Paloh, situated 10 miles or so north of Kluang in Johor (see map here). Like his father before him, Mr Tan was a pork seller. In 1943, and at the tender age of 18 (yes I know the numbers do not quite add up, but I quote what he told me), Mr Tan joined the underground resistance forces to fight the Japanese occupying army(possibly the MPAJA or Malayan People’s Anti-Japanese Army). They engaged mainly in guerilla warfare, and operated in squads of about 9 to 10 men. This he did for two years until the war ended in 1945 with the surrender of the Japanese. Then, at the age of 20, he was asked to join the army (I think he was referring here to the communists who fought the British after the war). He was reluctant to do that, and so he decided to come to Singapore. At that time, Singapore was part of Malaya, and so he did not actually migrate to another country. For a few years in Singapore, he worked as an employee for another pork seller. Later, he began to operate his own itinerant business selling pork in the Serangoon Garden area from a bicycle. When the Serangoon Garden market was built in 1962, the government offered him a stall which he operated until his retirement. The rental then was about $5 a month. 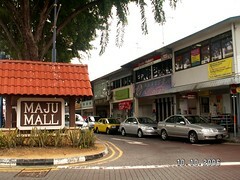 At that time, he stayed at a kampong in Yio Chu Kang, near the Kok Wah Theatre. Young people would probably not know where that was. 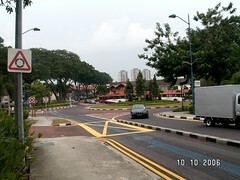 It was at the junction of Yio Chu Kang Road and Upper Serangoon Road. He bought his pigs from local farms which were quite plentiful in Singapore those days. As I reflected on this fact, I realized that I very likely could have patronized Mr Tan’s stall. You see, during the sixties, for a short period, and for reasons I cannot recall, I was tasked by my mother to cycle from our kampong in Lorong Kinchir to do simple marketing in the Serangoon Garden market. 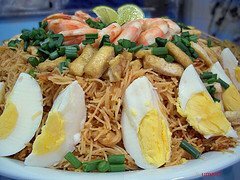 I learnt how to buy a few basic items like pork, bean curd (tau kua), bean sprouts (tau gay) and noodles. I am also reminded that my father did try his hand at rearing pigs for a short while to supplement our income. We only had 2 pigs and after that we stopped. Presumably, it was too much work and not cost effective. Of course we did not slaughter the pigs ourselves. When the PAP (People’s Action Party) came into power in 1959, Mr Tan joined the Serangoon Garden CCC. He recalled that the first MP (member of parliament) he served under was a Mr Liang Jing Sheng (pronounced in Mandarin) who later left to join the Barisan Socialis. I checked the internet, but was not able to find anyone in the Barisan Socialis by this name. I suspect it was somebody called Dr Sheng Nam Chin. His fellow CCC members, like my dad, were from the surrounding kampongs like Cheng San, Hwi Yoh, Yio Chu Kang and Ow Kang (Hougang).The next MP was a Mr R. A. Gonzales, followed by Mr Rodrigo and Dr Lau Teik Soon. If Mr Tan is right, then I have made a mistake when I told you earlier that we had a MP by the name of Tan Kia Gan (my eldest brother Chun Chew; the one with the supposedly ‘elephant’ memory, to be blamed for this misinformation .. haha) Mr Tan continued to serve all the way until 1997 when he was asked to join the Aljunied GRC (Group Representative Constituency). He declined saying that he was getting on in age and could not speak English. Photo from the National Archives of Singapore showing member of parliament, R. A. Gonzales leading members of the Serangoon Garden Citizen’s Consultative Committee in a ‘gotong royong’ project to repair Cheng San Road. Altogether, Mr Tan had 6 children; 3 sons and 3 daughters, and 8 grand children, the oldest of which is in his thirties and married with children; which meant that Mr Tan is a great grand father. He said his children did not excel in studies and consequently were in the pork business like him. His is widowed. His wife passed away about 10 years ago. Except for a problem with his leg, he was mentally alert and could move about on his own with the aid of a walking stick. 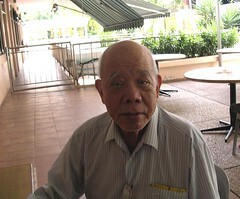 I think it is really fated that I should meet Mr Tan Pan Beng and share this story with you. One thing I learned from this story is that, one does not have to be in a highly ‘intellectual’ job to have a good healthy brain; and pork apparently is not so unhealthy a food after all. I would like to pick up from where Chun See left off by sharing a bit of history about the fruit trees from my kampong days. I grew up in a kampong near the Hill View area. 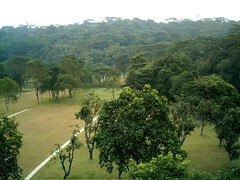 There were many fruit trees in the nearby Bukit Gombak. As children, we often went up there to pluck fruits - either by climbing the tree, or using our ’ Lastic’ (catapult) to shoot down the fruits, or simply by throwing dry branches at them. All these happened about 30 years ago. Unfortunately, the Bt Gombak area is now part of the Mindef, as thus a restricted area. Besides the common fruit trees that Chun See mentioned, I would like to touch on those fruits that are not so commonly seen in the markets; and probably not so familiar to young Singaporeans. 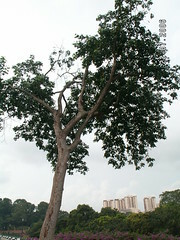 It’s not easy to find a Buah Suntol tree nowadays in Singapore. But I managed to spot one recently. Can you guess where this picture was taken? This tree is in the MacRitchie Reservoir just next the slope where I took the pictures of the kids playing with the Carton Boxes. Here’s what the fruit looks like. (Please don’t ask how I managed to ‘pluck’ the fruits.) The taste is hard to describe, a bit sour and sweet; not like any other fruit that I can think of. Surprisingly, even a ‘kampong boy’ like Chun See have not tasted it before. If you are curious to taste it, you can go to the Thai emporium at Golden Mile Complex where they sell for about $5 per kilo and the size is much bigger than the ones below. 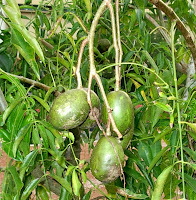 The fruit is slightly bigger than an egg and has the shape of the avocado, and tastes quite sour. 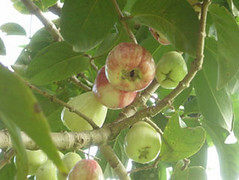 The skin is green when unripe, and brownish-yellow when ripe. The seed is very hard and has lots of fibres. You can find them in many shops in the pickled form. I am not talking about the water apple that Chun See talked about. It is more rounded in shape. And the seed is round like a marble, and the colour is a mixture of beige and reddish stripes. The only time I saw this tree in Singapore was at the Singapore Science Centre about two years ago. By the way, if you want to see what the common jambu (water apple) tree look like, you can go down to Bishan Park – the section between Marymount Avenue and Thomson Road. 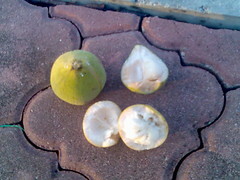 I bet not many of you know about this fruit. Not even my ‘kampong boy’ friend Chun See has seen this one. Hor Pow Kor is the Hakka name for this fruit, because it looks like a purse. It sprouts in clusters from the tree trunk near the base of the tree. We eat this fresh immediately plucking from the tree. 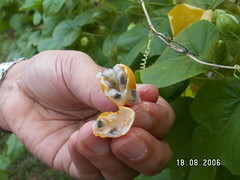 Your can see some pictures of what this fruit looks like at http://toptropicals.com/catalog/uid/Cynometra_cauliflora.htm. This is a smaller version of the longan which we can buy in the market. The tree is very hard to climb because the trunk is very thick, so we used dry branches to throw at them. 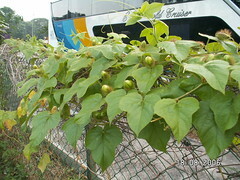 The buah susu is creeper that can still be found growing along roadside fences in many parts of Singapore. I wonder how many of you know that the ‘fruit’ is edible. It has a sweet and sour taste. But the fruit is too small to fill your stomachs though. This is what the area looks like today. Bukit Gombak CC and the surrounding HDB flats have all gone. If you know where we can find these fruit trees in Singapore, please let us and our readers know. I sure would like to bring my son to see and learn about fruits that his old man used to have such a great time plucking. And if my friend Chun See can use his ‘guanxi’ with his Army Museum friends to arrange for me to visit Bukit Gombak with my son, that would be a dream come true.